The project „Four Seasons in the Sky“/ „Cztery pory roku na niebie” revolves around observations of astronomical phenomena related to the seasons in various places in Europe. The activities will be implemented in four main blocks: Autumn in the sky, Winter in the sky, Spring in the sky and Summer in the sky. The four blocks are the basis of specially designed project activities including astrophysics, astrochemistry, mathematics, ICT (with 3D programming and printing) and foreign language learning. All astronomical observations will take place at schools or local observatories as well as science centers and will be documented and disseminated. Some of the observations will be idely available to local communities. There are also plans to visit places of special scientific or cultural value (museums, science centers, archaeological monuments). Between the mobilities in the partner countries a series of tasks related to new technologies (film making, presentations, 3D programming, etc. ), lectures, lessons and exhibitions connected with the subject of astronomy, as well as more broadly to science, culture and literature are planned. The goals of the project are an innovative approach to teaching and learning the sciences. Through an interesting topic of astronomy and precisely planned interdisciplinary exercises, we want to motivate students to learn the sciences, choose them in external examinations and to further development in this field at technical universities, which prevents early school leaving and unemployment. In addition, the project assumes equal opportunities in access to high-level education for young people from small villages and towns, in difficult economic and social situation, immigrants and girls. The aim of the project activities and visits in different countries is also to interest students in common European scientific and cultural heritage, to increase European awareness and to develop new, innovative teaching methods at the level of teachers and, more broadly, institutions. All schools will develop through international cooperation and exchange of experience. The project will directly engage 144 students aged 15-19 and 12 teachers from 6 partner countries, however, the impact of the project will be much greater, because the results will be disseminated in local societies and presented in the media. The schools will select the participants according to recruitment regulations assuming an equal number of men and women in the project. All project activities, both substantive and organizational, will be evaluated on a regular basis in order to ensure a high quality of the project, which is to lead to the achievement of the objectives. CALL for participants – Poland 2018! We invite students who are interested in astronomy, astrophysics, astrochemistry, NASA to take part in mobility on 5-9 November 2018 to Poland, Koszalin. 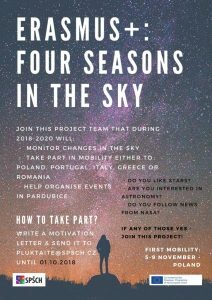 If you are interested to take part in first mobility, please send your motivation letter (in English) to pluktaite@spsch.cz until 01.10.2018. If you have any questions – please contact Justina Pluktaite (pluktaite@spsch.cz) or visit K265. Don’t miss your chance to be active, learn new things, meet new people and improve your English.